Burgle Bros is a tower heist, pure and simple. The game takes place over three separate floors and puts a heavy emphasis on stealth tactics, while also giving each member of the heist crew their own effective specialty. The tower setup is randomized between each game, giving Burgle Bros more replay value than the average co-op, while the ability to hop between floors provides enough of a puzzle solving crunch that you'll want to give it another shot. 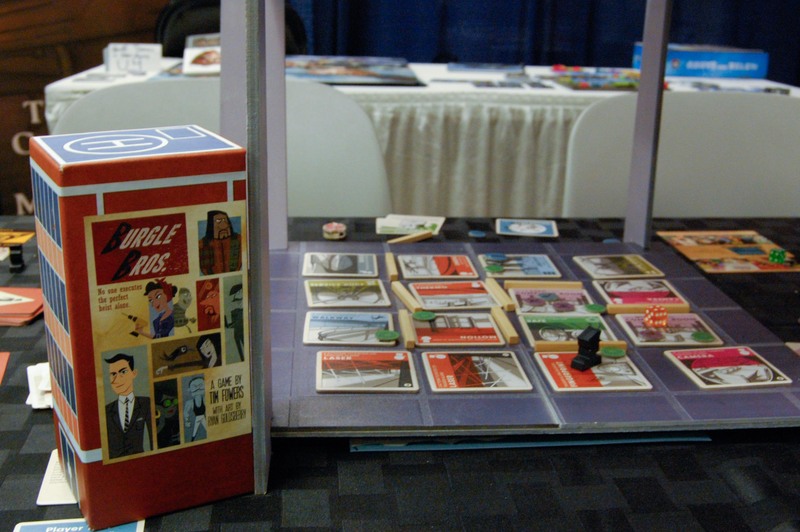 The co-op hit of BGG.CON, Burgle Bros is another game that was seeing a ton of action throughout the show due to its status as a recently-delivered Kickstarter project. Gamers had their copies in tow, eager to get them to the table, and reception was positive across the board. Self-published indie game designer Tim Fowers is now three-for-three following the successful Wok Star, and Paperback, so even non-backers took notice, making Burgle Bros one of several hot games to sell out on the show floor. For those not at BGG.CON, though, Burgle Bros is sold direct online, and is now in stock.